A couple weeks ago we went on a weekend adventure in one of our favorite cities, Chicago. We’ll start off by saying that a weekend is simply NOT enough time to explore this beautiful, friendly, and intriguing city. But boy did we make the most of those 48 hours!! (We’re working on a blog post with all that we did and saw… so more on that later.) We’re already dreaming about our next trip to the Windy City. Partially because we weren’t able to see everything we wanted to, and partially because we absolutely ADORED where we stayed! In two short days it truly felt like home to us, which says a lot about this stunning property! 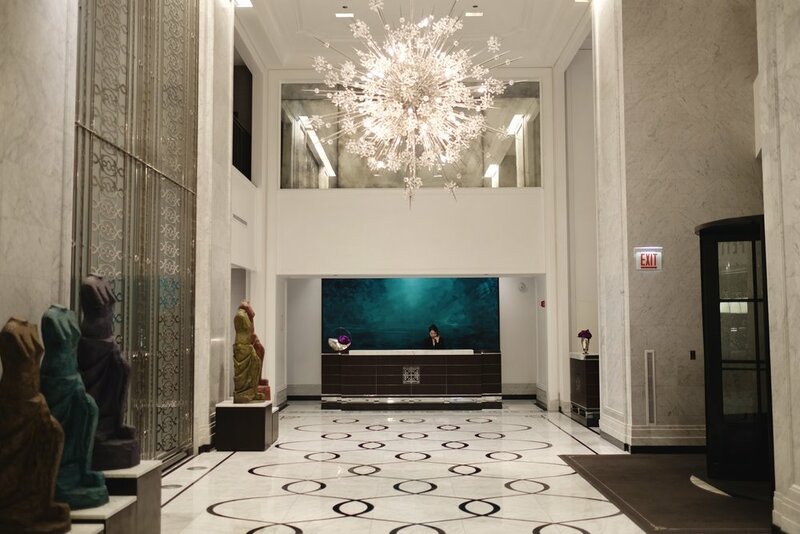 If you’ve ever stayed at a Waldorf Astoria before, you know the high level of luxury, detail, and comfort you can expect at every location. The staff is attentive, friendly, and knows everything about the city. They upgraded us to the most beautiful suite, the "Astoria Suite" that had panoramic views of the downtown, a living room and the coziest little balcony! When we arrived, we found some tasty chocolates and a bottle of red wine waiting for us. It was so picturesque with the fire place in our room that we didn't want to eat the chocolate (hehe that didn't last long). Once we popped the bottle, we spent our time between our cozy fireplace and watching the hustle and bustle of the city below from our balcony. Speaking of hustle and bustle - the location of the Waldorf Astoria is beyond ideal. 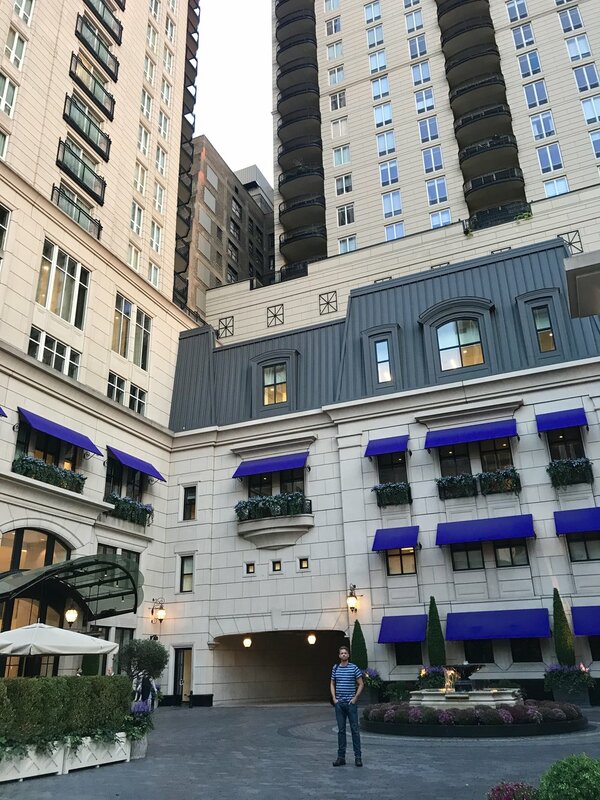 Located in Chicago's Gold Coast neighborhood, we were surrounded by tons of amazing restaurants, incredible shopping, as well as Lake Michigan. We walked EVERYWHERE and were just a few blocks from the water. For us, location is incredibly important when picking a hotel, and finding a spot that’s just right in a big city can be overwhelming. The Waldorf definitely did not disappoint! We’re big critics when it comes to hotel beds. Let’s be real - there’s nothing better than a fluffy, comfy, hotel bed. And boy did the Waldorf Astoria deliver!! This bed was GOALS. The perfect amount of fluff and firm - and that balance is hard to find! We could’ve spent all day right there!! Another bonus - They have 2 delicious restaurants, both curated by one of our favorite chefs, Michael Mina! Petit Margeaux is a french patisserie located in the lobby, great for coffee, cocktails, pastries, and savory baked goods. Margeaux Brasserie, which gives off the vibes of a Parisian cafe and combines it with delicious french cuisine and a fantastic bar. One we gauge the quality of a restaurant/bar is the bartender. You know you're at a good spot if the bartender can whip up a custom concoction based on what you say you like - which is exactly what we experienced here. If you stay at the Waldorf, you must go to Petit Margeaux for your morning coffee and pastry, and start your evening with a whiskey cocktail from Margeaux Brasserie. You're welcome.